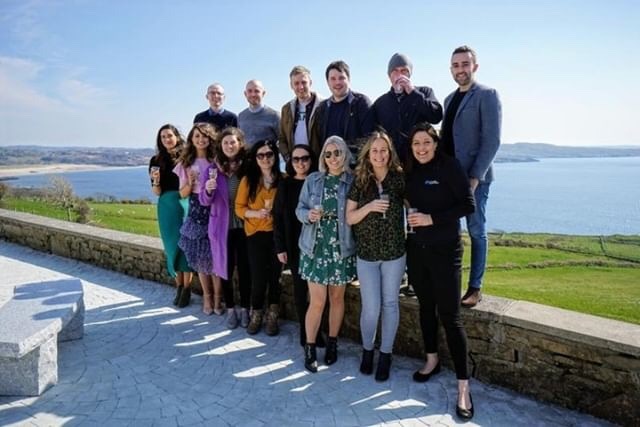 Saturday saw the launch of the first ever – South West Donegal Food Tour – from Donegal Town towards the Sliabh Liag region. We are very excited about this new route and to work with all the amazing producers in this part of the county. The food tours aim to highlight all the produce on offer in the county and make Donegal a food destination. First stop on Saturdays South West Donegal tour was The House Gastro Pub in Donegal Town with the group attending the launch of the venues brand new brunch menu. They sampled local lobster with curried leaks, banana nutella toasted hazelnut pancakes, open sandwiches with crispy bacon asparagus and poached eggs to name a few dishes. Barry and Adam Kemp (Owners of The House Gastro Pub) are not afraid of trying something new and are great supporters of local producers. The tour then travelled towards The Rusty Mackerel in Teelin (around 30 minutes away), which is famed for its local seafood. The weather was spectacular on Saturday which allowed the group some fantastic photo ops at the stunning view point in Largy over the North Atlantic on route. On arrival at The Rusty Mackerel guests tried a selection of smoked mackerel pate on homemade brown bread, prawn cocktail and smoked salmon. Of course The Sliabh Liag Distillery at Carrick was next on the list of stops for the day (5-10 minutes from Teelin) to try the delicious An Dúlamán Gin. The group learnt much about the distillation process of gin and the unique ingredients that gave An Dúlamán its distinct savoury flavour. An Dúlamán is made using five locally harvested varieties of seaweed, as well as six other botanicals. This makes An Dúlamán as unique as the Donegal coast itself. The tour group spent around 45 minutes in the distillery before venturing on towards the fabulous Kitty Kellys in Kilcar (10 minutes from Carrick) to try Chef Remy Dupuy’s famous prawn and monkfish dish soaked in garlic butter as well as confit of duck and crab bon bons. Here they also had a visit from Donegal Farmhouse Cheese – makers James and Noreen Cunningham. This cheese is made, literally a stone throw away from the restaurant. While you cannot visit the facility at present there are plans for agri-tourism in the future. In keeping with the sea theme of the day the tour continued back along the road to Killybegs making their last stop at Ahoy Cafe. Ahoy is situated right in the middle of the town with stunning views of the harbour. The Spring sun meant guests were able to sit outside and dine al fresco, enjoying seafood chowder and crab sliders made from seafood fresh of the boats in front of the cafe. On the trip back to Donegal Town guests enjoyed individual bags of Mallow Mia Marshmallows which are made in Newtowncunningham and are always a winner on the tours to end the day on a sweet note. Please see our calendar for tour dates. Private bookings can also be made for groups of 10 or more. Regular tours on this route consist of 4 stops running 1pm – 6pm and are priced at €75. Please be advised venues vary depending on availability. Donegal has a brand new Cheddar Cheese!